Photo courtesy of the organizers. For more information, call 812-546-0640. Saturday evening laughter will reign supreme at WILLow LeaVes of Hope. 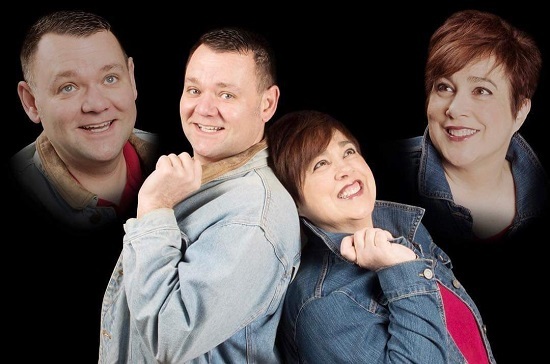 Area residents are invited to an evening of improv comedy with ‘The Cori and Pete Show,’ presented by the Actors’ Studio of Hope and 626 Productions in association with WILLow LeaVes of Hope. Hope resident Pete Law says he hopes the show serves not only as an introduction to improv for the Hope Community, but that the show leads to more of its kind in the future. When considering bringing an improv show to Hope, Law collaborated with long-time friend and acting colleague Cori Brod. Brod began acting in high school, but took time off to raise children and, now that they’re grown, she has gravitated back to the stage. The Columbus resident says improv is something she truly enjoys and hopes it will spark interest in the audience. “It’s an audience participation kind of thing, it’s fun and different every time,” she says. She admits audiences are often hesitant in the beginning, but as the show goes on people relax and start yelling out suggestions for the actors. Improv is comprised of a series of ‘games,’ Brod explains. Games is a general term used to define the different scenarios or skits actors pursue based on audience suggestion. For instance, people write down a line from a movie or book and put them in a hat. The actors then pull from the hat and the suggestions frame the scene. One game Law is looking forward to is known as Lounge Lizard. During this skit, actors go out into the audience and interview people, then make up a song based on what the audience member says. The flow of the show, like its contents, is based entirely on the audience, Law says. The uncertainty of what audience members may suggest is what makes the whole process so much fun, Brod says. Traditional improv is usually broken down into 10 to 20 minute skits, Brod says. However, this show will be nearly 90 minutes, which translates to nearly one dozen games with an intermission. Law admits it is the audience’s laughter that he enjoys the most. It is the audience’s enthusiasm that fuels the show, he says.